KIEV, Ukraine -- Ukrainian, Russian and Western diplomats held emergency talks in Switzerland on Thursday, in the hope of resolving a deepening crisis that has seen armed pro-Russian protesters seize swaths of Ukraine. Will Ukraine talks yield results? The unrest in the restive east, which shares a border with Russia, is spiraling so fast, it has left diplomacy writhing in the dust. In the southeastern city of Mariupol, a gang of 300 attacked a Ukrainian military base Thursday, leading to gunfire between the two sides. In Donetsk, the self-declared chairman of the people's council said he wants a referendum by May 11 to ask residents if they wanted sovereignty. Amid it all, the U.S. is talking fresh sanctions, which will certainly not make the mood in Russia more conciliatory. Such are the challenges the European Union and the United States confronted when bringing together the Kremlin and Kiev on Thursday to find a way out of the worst East-West crisis since the end of the Cold War. Kiev's embattled new leaders are struggling to reassert their authority in eastern towns largely controlled by armed pro-Russian separatists. They have tried dialogue and a show of force, both to little effect. The Geneva gathering will be the first meeting since the crisis worsened. Speaking in a televised question-and-answer session, Russian President Vladimir Putin said the talks were important "to figure out how to get out of this situation." However, he also reiterated his thoughts about Kiev's new interim government -- in place since pro-Moscow President Viktor Yanukovych was ousted in February after months of protests -- calling it "illegitimate" and without a national mandate. Presidential elections in May are taking place under "unacceptable conditions," he added. 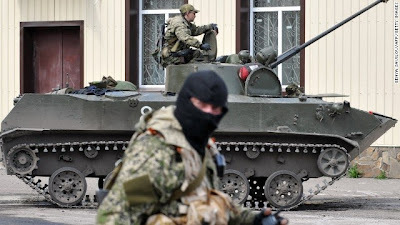 Earlier Thursday, in bloodshed likely to overshadow the meeting, about 300 pro-Russian militants repeatedly attacked a military base in Mariupol, Kiev said. Soldiers opened fire, killing three attackers, wounding 13 and detaining 63 others. "The 25th Airborne Brigade whose soldiers showed cowardice and laid down weapons will be disbanded," acting President Oleksandr Turchynov told parliament. "Guilty soldiers will stand before the court." Seeking another referendum In an ominous echo to what happened in Crimea just weeks ago, the Donetsk People's Republic wants to follow that region's lead and hold a referendum early next month, said Denis Pushilin, the self-declared chairman of the people's council. The referendum will essentially ask residents which country they want to be a part of: Russia or Ukraine. "The threats to Russian-speaking people were absolutely clear, and that is why people of Crimea voted for their future and asked Russia for help," he said. "Russia never planned any annexation, never, quite the contrary." Threats of sanctions Kiev and the West don't believe Putin. They accuse Moscow of stirring up the unrest, pointing to the 40,000 Russian troops that NATO says are assembled near the Ukrainian frontier. Moscow insists the troops are merely conducting exercises. On Wednesday, U.S. President Barack Obama said Russia's actions risk more sanctions for the country. It is likely that Defense Secretary Chuck Hagel will announce additional nonlethal aid for Ukraine on Thursday, a senior Pentagon official told CNN. The Pentagon is still not supporting lethal aid for Ukraine "because it could exacerbate the situation, which is what we do not want to do," the official said. Since Yanukovych's ouster, Kiev's interim government has faced a wave of protests in the Russian-speaking east. In the cities of east Ukraine, the atmosphere seemed more relaxed than it was a few days ago, with many residents apparently welcoming the presence of pro-Russian forces and their seized military vehicles. At the same time, on the road toward Slaviansk, CNN's Phil Black encountered a heavily fortified and well-organized police checkpoint and saw signs of a large military buildup. Attack helicopters passed overhead while armored vehicles and troop carriers rumbled by. But despite the heightened military activity, there has so far been no effort to move into the town itself. Pro-Russian protesters were digging in and consolidating their power. Russia supplies 30% of Europe's gas needs. It has threatened to cut off supplies to Ukraine because of debts.